Printer for high volumes of printing, excellent for commercial applications. The Epson DFX 5000 prints up to 560 characters per second. Day after day, this printer prints accounting reports, spreadsheets, multi-part forms, labels, etc. The DFX 5000 has an integrated interface slot type B, which allows connection to corporate networks, whether Ethernet, Twinaxial or Coaxial. Windows® 95 users can program the Epson DFX 5000 to "remember" up to five different forms and two special types of paper. You simply have to pre-adjust the forms tool and the printer will remember the type, size and paper path. It is the most suitable for a certain printing task. 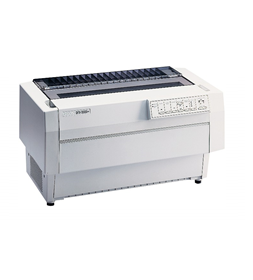 The DFX-5000 also automatically adjusts for variable paper thickness and, using the optional paper cutter, cuts pre-fed forms with much more precision. Bidirectional optimized in text and graphic. ** Page returns are declared by the manufacturer in accordance with ISO / IEC standards or are sometimes estimated based on 5% page coverage. The yields will vary considerably depending on the image, the coverage of the area, the printing mode and the environmental conditions.